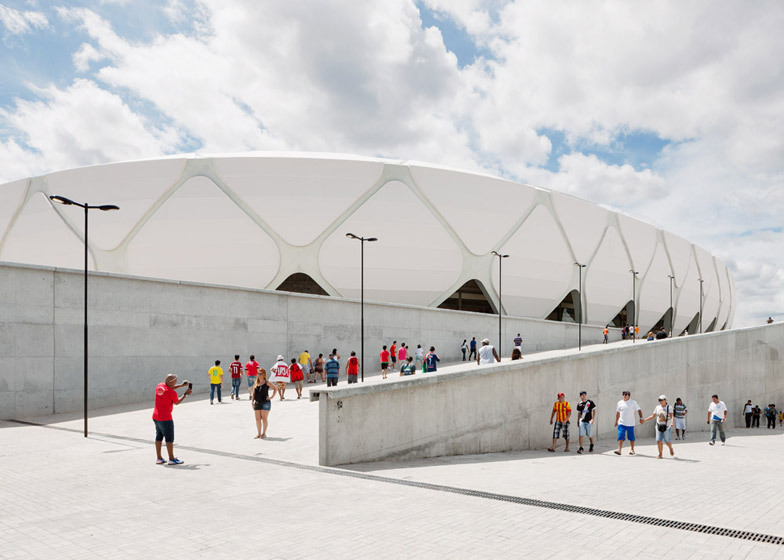 England's nail-biting World Cup football match against Italy on Saturday took place inside this basket-inspired stadium designed by German firm GMP Architekten in a city in the middle of the Amazon rainforest (+ slideshow). 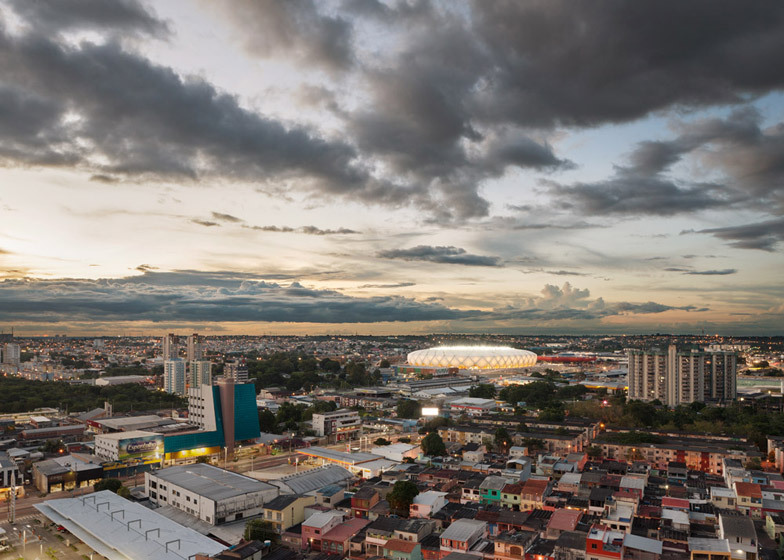 As one of three FIFA World Cup 2014 stadiums either designed or renovated by GMP Architekten, the Arena da Amazônia was built on the former site of a smaller stadium in Manaus, northern Brazil. 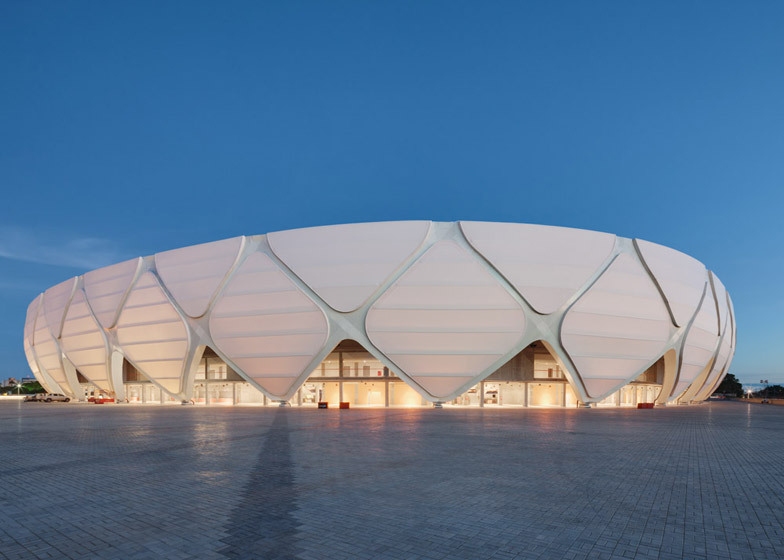 In response to the hot and humid climate, the arena is shaded by a curving facade and roof, featuring a criss-crossing exterior pattern intended to reference a traditional indigenous basket. 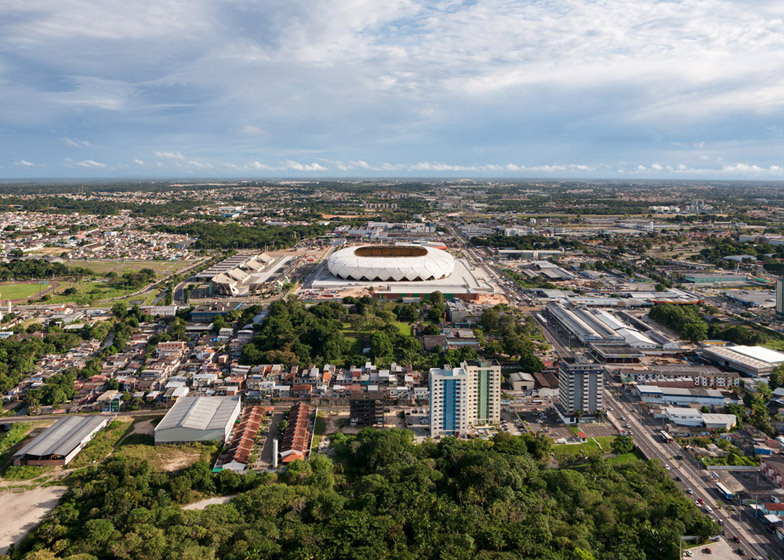 "With the design of the new Manaus stadium, the aim was to come up with a very simple but highly efficient stadium that would at the same time specifically symbolise the location, particularly the fascination and natural diversity of the tropical rainforest," said the architects. Held in place by a system of mutually bracing cantilevers, the roof provides shade and shelter over the spectator balconies, but will also channel rainwater away during the tropical showers that are typical throughout the year. Meanwhile, the exterior envelope is clad with a translucent fibreglass fabric that allows the building to visibly glow at night. 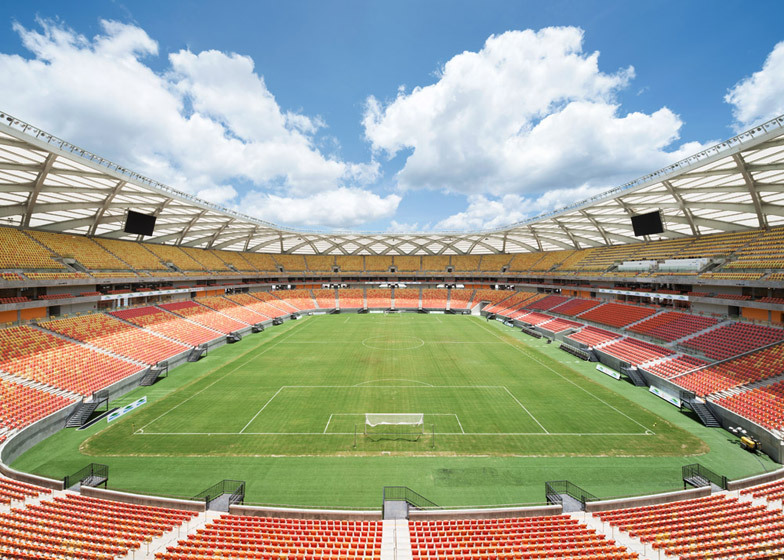 The stadium has capacity for just over 44,400 spectators and was constructed to host four World Cup fixtures. 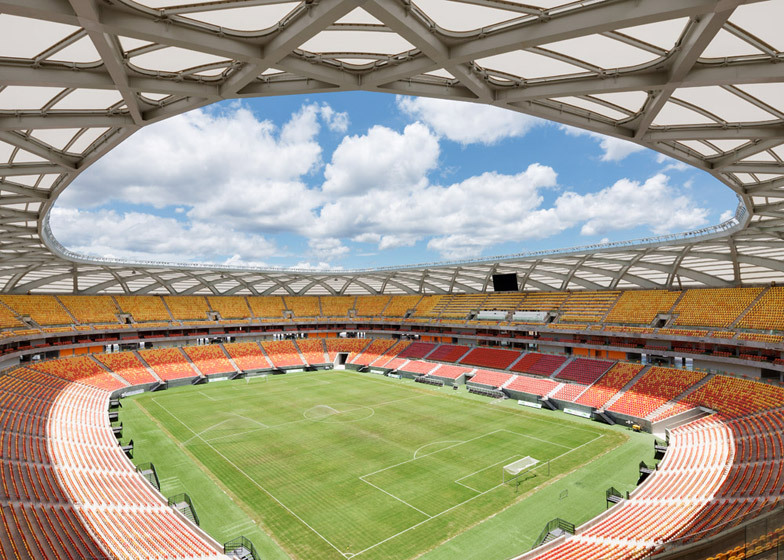 The first major game to take place in the stadium was between England and Italy, and it will also host group-phase matches between Cameroon and Croatia, the USA and Portugal, and Honduras and Switzerland. The base of the arena accommodates player facilities, parking areas, VIP access and media rooms. Offices, spectator boxes and a restaurant are located within a ring that separates the upper and lower tiers of seating stands. 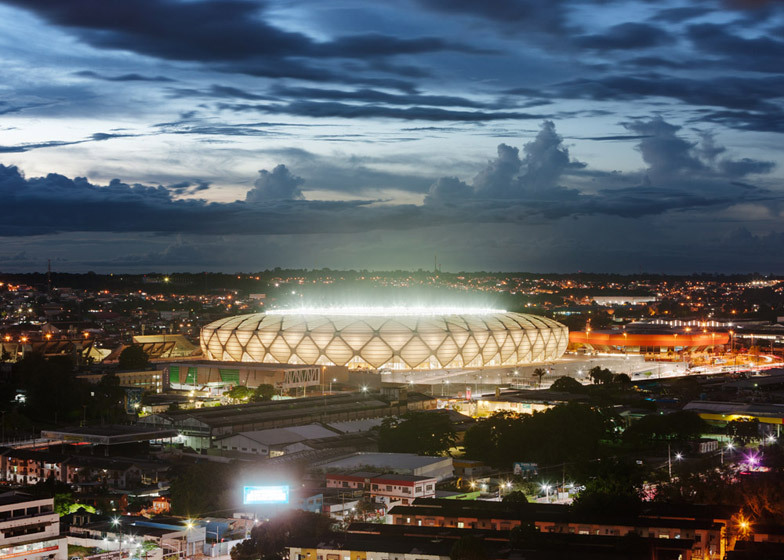 GMP Arkitechten, who previously designed three stadiums for the 2010 World Cup in South Africa, worked on the project in collaboration with São Paulo office Stadia and structural engineers Schlaich Bergermann und Partner. 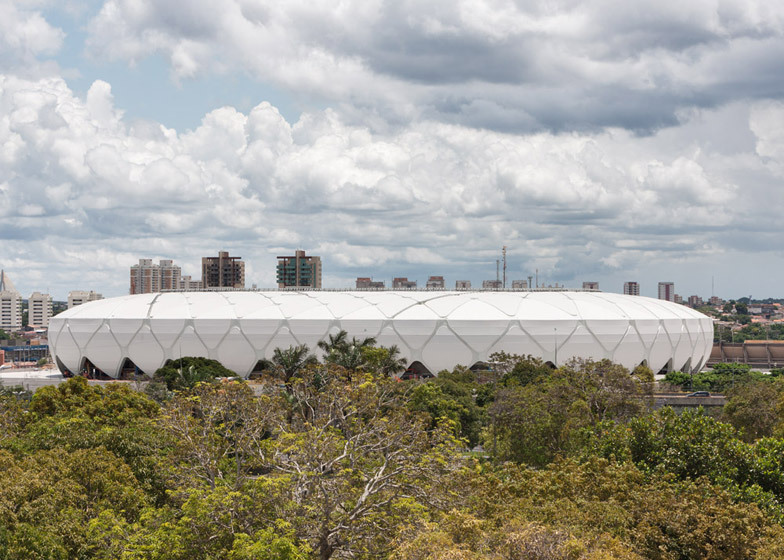 This time around the firm also developed the concept for BCMF Arquitetos' redevelopment of the 1960s-built Mineirão Stadium in Belo Horizonte and consulted on the renovation of the Estádio Nacional de Brasília. Located between the airport and the city centre, the building forms part of a sports park featuring an aquatic centre, field and track facilities, multi-purpose halls and a sambadrome – used for Brazilian parades. The new building was integrated into a sports park with Sambadrome, field and track facilities, multi-purpose halls and an aquatic centre. The project was developed in cooperation with the GMP partner practice STADIA from São Paulo and the structural engineers Schlaich Bergermann und Partner. The roof structure is composed of mutually bracing cantilever elements in the form of hollow steel box girders which also serve as large gutters for the discharge of the enormous quantities of water expected during tropical rain events. In view of the hot and humid climate at the Amazon, the roof extends into a facade which provides shade to the spectator balconies and vertical access routes. 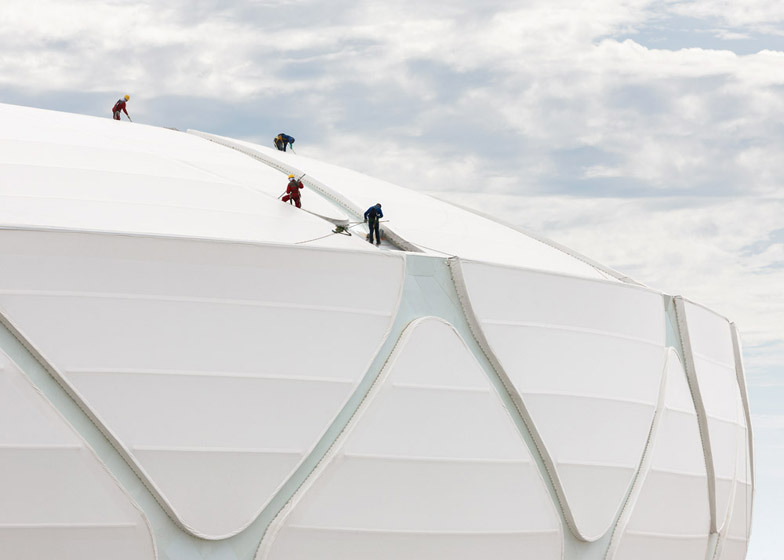 The roof and facade panels consist of translucent glass fibre fabric.